Pre-heat oven to 350 degrees F and line muffin pan with baking cup liners. In a large mixing bowl, beat sugar and oil together. Add eggs and squeeze bananas out of skin into mixing bowl; they should easily slide out of the skin and somewhat liquid feeling. This will depend on how ripe the banana was before you froze it. Beat well. Combine flour, flaxseed, baking soda, baking powder, and salt. Slowly add to banana mixture and blend until all flour mixture is mixed in well. Add vanilla and milk, mix until incorporated. Fill muffin cups ¾ full and bake for 15-18 minutes until golden brown. Do not overbake. Dietitians Tip: I always have brown bananas at the end of the week and toss them in my freezer; I take six out and place them in a Tupperware to thaw for about an hour before making these muffins. I make a double batch and freeze them in gallon size zip lock freezer bags. Easy to thaw and eat on the go. 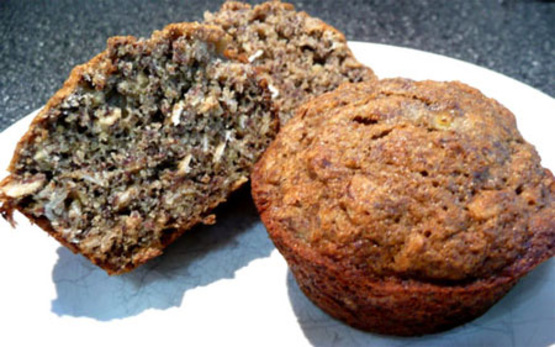 Using flax seeds and Omega-3 eggs increases the Omega-3 content of these muffins.